Breaking Bad Spin-off Better Call Saul already commissioned for second season. American television network AMC have commissioned a second series of Breaking Bad spin-off Better Call Saul before the first episode has even gone to air. 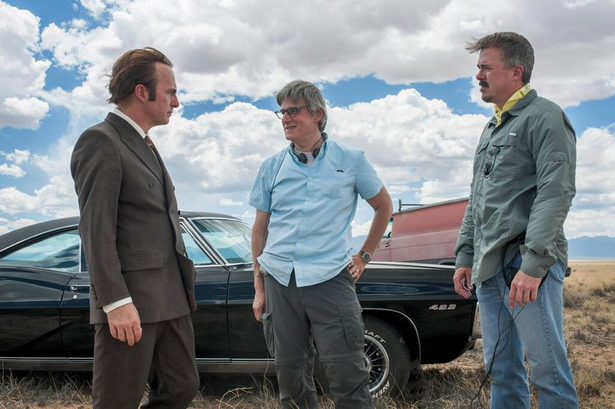 They also released the first image from the set (above) of star Bob Odenkirk with creator Vince Gilligan and co-showrunner Peter Gould to wet fans appetites for the series. The show will serve as a prequel to Breaking Bad, one of the most critically lauded shows of all time, and will follow the exploits of seedy lawyer Saul Goodman prior to his encounters with meth manufacturer Walter White. Odenkirk will be joined by fellow Breaking Bad regular Jonathan Banks, who played cop turned criminal Mike Ehrmantraut from season two onward. It’s also been widely reported that Bryan Cranston and Aaron Paul (who played the now iconic roles of Walter White and Jesse Pinkman) will appear in the spin off. Though Paul seemed to recently quash rumours of his appearance, stating “To be honest, it’s not gonna happen” fans are still keen to see him appear, and he previously expressed an interest in portraying Jesse Pinkman in lighter times, so it’s still hugely possible. It’s rumoured that Cranston will appear back in his teaching days, or as part of a story centering around Grey Matter Technologies. The series will air in early 2015.